Imagine a meringue that’s crunchy on the outside but soft and chewy on the inside, slathered with luscious lemon curd and light whipped cream, then sprinkled with toasted almond and coconut. 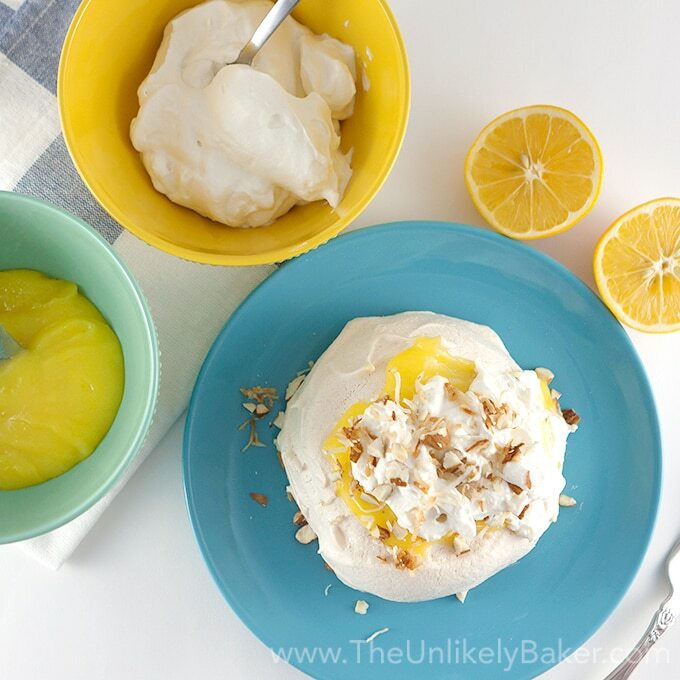 This lemon pavlova is a bright ray of sunshine on a dreary winter day. It’s no secret that I love Christmas. It’s my favourite time of the year (well, apart from my birthday lol). And this year Christmas came extra early. First, Meyer lemons – one of my favourite things! – started appearing on shelves at our store so I proceeded to hoard them (hey, they’re only available for a limited time) and immediately got so overwhelmed with lemon baking thoughts. Second, I received a lovely gift in the mail – a dark sandalwood and slate Frankie 35 wood watch from JORD Wood Watches. I’ve never had a wood watch before and this timepiece is exceptional. Looks like I found yet another reason to love the season! Do you have that one person on your list that’s just impossible to buy a present for? 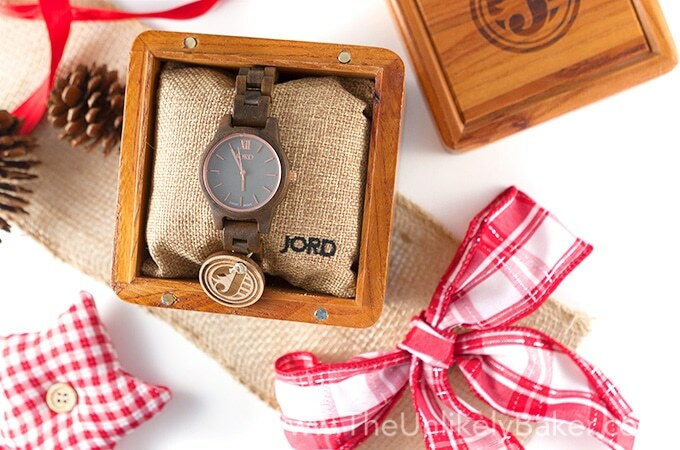 The unique wood watches from JORD is the answer. Their men’s and women’s collections are filled with stunning pieces that are impeccably designed (the company is run by artists, designers, marketers and minders after all! ), made of sapphire crystal glass (second only to diamond as the hardest and most scratch resistant material on earth) and different wood from around the world. Each watch is also customizable for a truly personalized piece. The best part? You can own one too! JORD is giving away $25 off your purchase. Just visit this link and the e-card is yours. Hurry because the offer ends on December 21 (11:59PM)! This really is a wonderful present. The timing (well aren’t I clever) is perfect too – with Christmas so near my new JORD watch and I would enjoy so many holiday parties together. In fact I already showed off my new watch wore my new watch at a party we hosted. People were gushing (and I was so proud!). They were gushing about this lemon pavlova that we served too. The meringue was perfectly crunchy outside but sticky and chewy inside. The homemade lemon curd was sweet and tart. 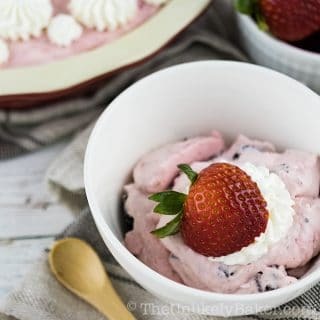 The homemade whipped cream added freshness to the bite. 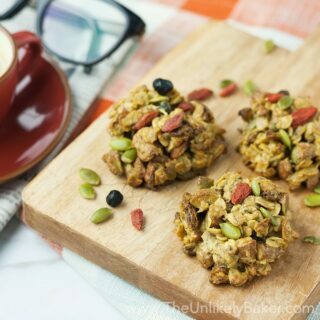 While the toasted almonds and coconut provided texture. It was a fantastic treat. Make sure your egg whites are room temperature. They whip better and you’d get better volume. It’s easier to separate egg whites from the yolks when the eggs are cold though so what I do is separate the whites from the yolks while the eggs are cold straight out of the fridge then bring the whites to room temperature in a separate bowl (usually 15-20 minutes, or however long it takes for me to prep everything else). Speaking of yolks, make sure none of it get to your egg whites. It will spell disaster. Also make sure your bowl and whisk are dry and grease free. 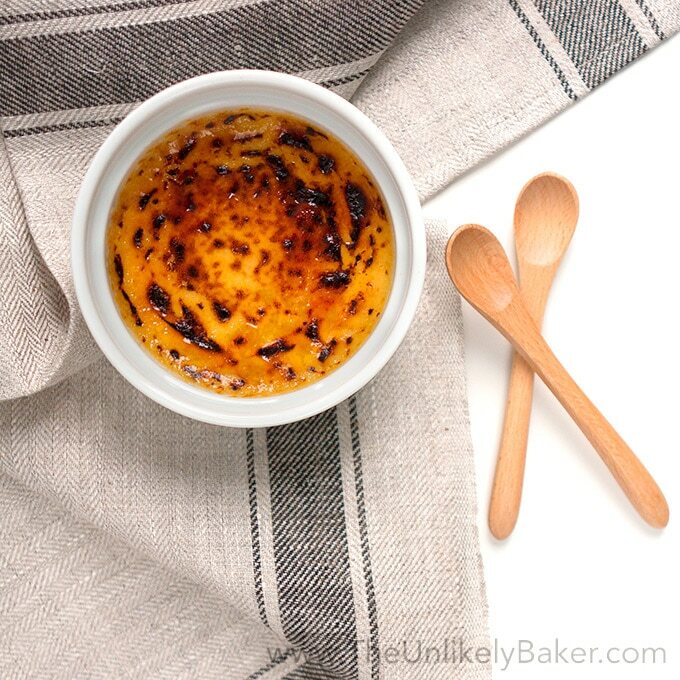 Don’t use a plastic bowl because oil tends to stick to them; stainless steel or glass bowls are the best. When adding sugar, do so gradually (I usually do about a tablespoon at a time). Don’t dump a cup of sugar all at once – your meringue might not come together or if it does, it will take longer. This is optional for some people but I always use cream of tartar or white vinegar to stabilize my meringue. It does not affect the taste – it just makes the meringue firmer and less likely to fall apart. Now that’s out of the way, it’s time to assemble! I’m a heavy froster so it follows that I’m also a heavy pavlova-assembler (what can I say, I get carried away). So my first pavlova was way too sweet. So the lesson here is: taste your components first. See how much of each would lead to that perfect bite then start piling them on! 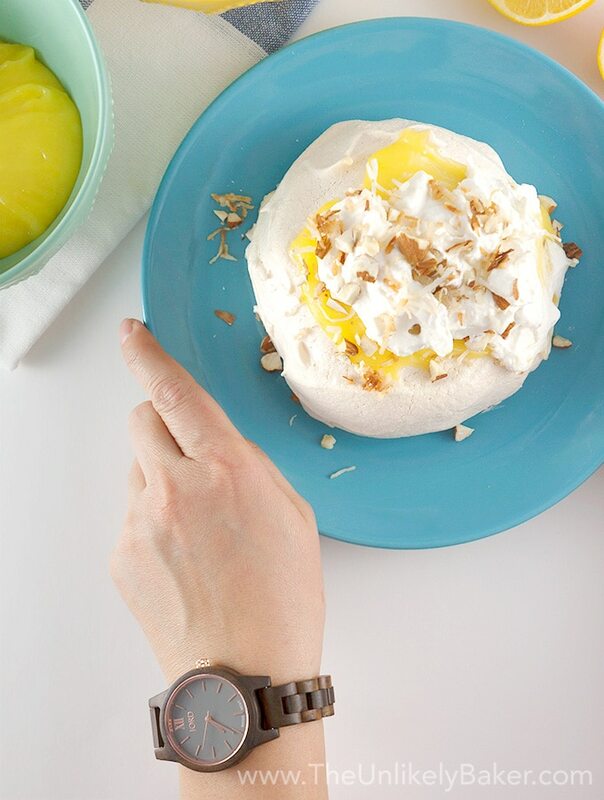 Make a lemon pavlova this holiday season. It’s a bright, light holiday dessert. (And remember to enter our JORD giveaway.) Happy holidays! Disclosure: This post is sponsored by JORD Wood Watches but all photos, words and opinions are mine. Thank you for supporting the brands that support me! Lemon pavlova - meringue topped with lemon curd and whipped cream then sprinkled with toasted almond and coconut. 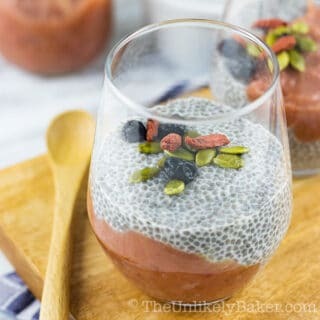 A bright and delicious dessert! 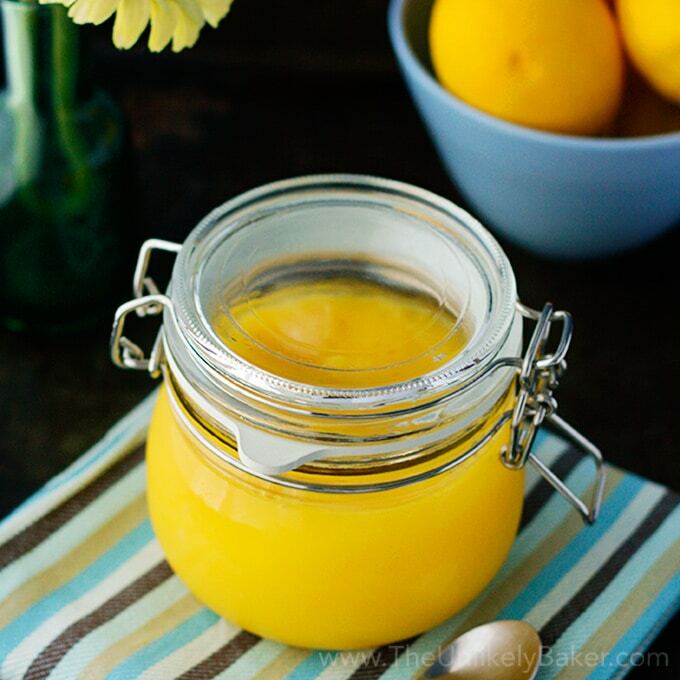 See this recipe for homemade lemon curd. You can also buy a jar of your favourite ready-made brand. See this recipe for homemade whipped cream. You can also use ready-made. Preheat your oven to 275F. Take parchment paper cut to fit your baking pan and draw 4 circles on it that's 4 inches in diameter, leaving a space around each circle. Turn the parchment paper over and line your baking pan with it. Set aside. 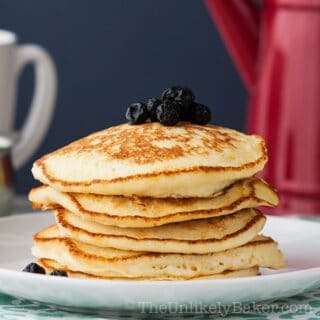 Using a handheld electric mixer or a stand mixer with the whisk attachment, beat the egg whites at medium high speed until you reach soft peaks. Add the 1 cup of sugar a little at a time until you're almost at stiff peaks. Add 1/2 teaspoon vanilla extract and 1 teaspoon white vinegar and continue beating until your meringue is stiff and shiny. Transfer your meringue onto your lined baking sheet, scooping it into your 4 circles. Bake for 45 minutes then turn off the oven and leave the meringues inside the oven overnight to dry. Carefully lift the meringue off the parchment paper and store in an airtight container until you're ready to serve. Take your meringue and spread a good amount of lemon curd on top. Put a dollop of whipped cream on top of the lemon curd then sprinkle with toasted almonds and toasted coconuts. You can make the meringue and the lemon curd up to 3 days ahead. Just make sure you keep your meringue in an airtight container and your lemon curd in the fridge properly chilled. Did you make lemon pavlova? 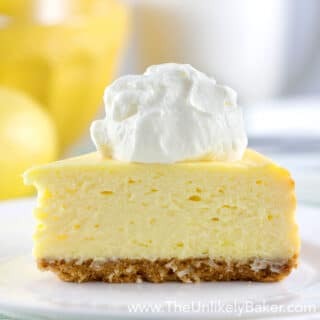 What are your favourite lemon desserts? Tell me about it in the comments section below. I’d love to hear all about it. It is delicious and it is a very cool watch! 🙂 I love both. Hope you check them out! I love any excuse to eat a lemon dessert; especially when it is tart. It makes me so sad when I make a recipe and I get really excited only to find out that the beautiful tart flavor of the lemon has been lost to the sugar. I’m so excited to try this! Hi Mackenzie! It’s really quite the balancing act with lemon eh? For this you have more control because you get to decide how much of the different components to put on your pavlova. Hopefully for that perfect bite! Enjoy! And happy new year! Wow! 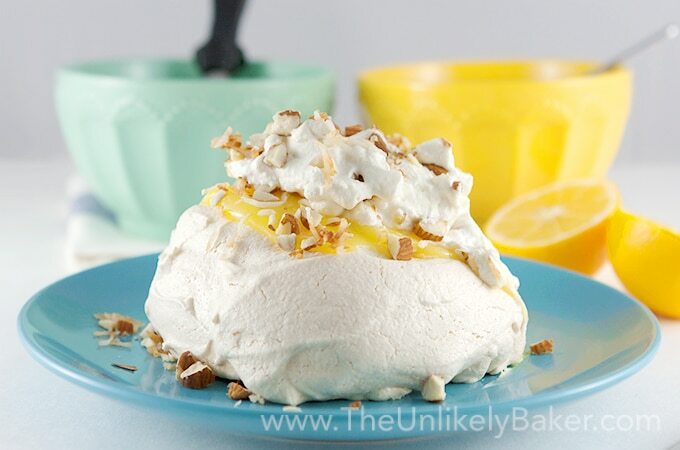 This is so stunning and combines 2 of my favourite things – meringues and lemon! I can’t wait to try making this myself! Can’t decide what I want more, the watch or the pavlova! This looks absolutely delicious! I need to give this a try for the holidays. This looks delicious. Thanks for all the tips on the meringue. For me it is not an easy skill to master. And it is gluten free! Yay! 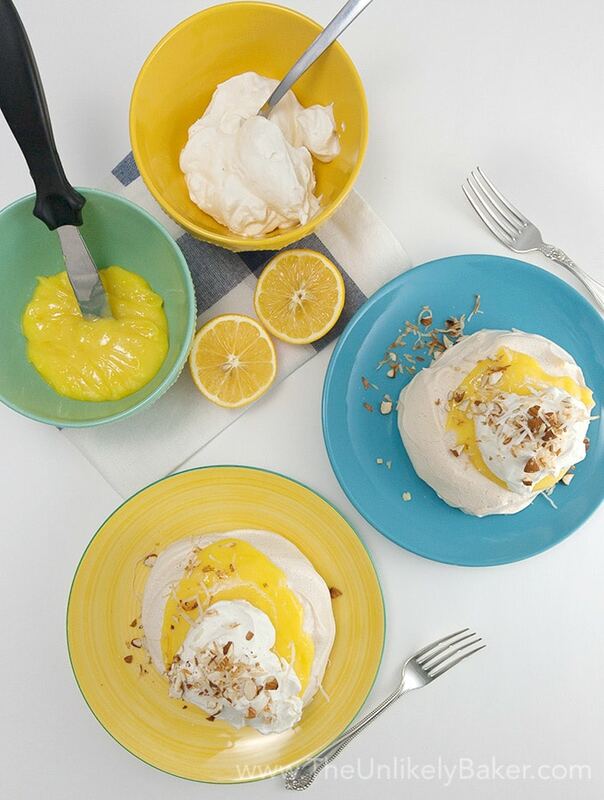 I love pavlova…the lemon curd is wonderful idea. It’s like a little bite of summer in the winter and I love it! Just looking at these delightful little desserts make me happy. That’s such a great watch! Love a good pavlova recipe! This one looks delicious! I love lemon so I will have to give that a try! I have a JORD watch as well and I really like the style you chose! Hi Crissy! Thanks hope you like it 🙂 And yeah, I’m really loving my JORD watch too. I could’t decide which one to pick initially, so many stunning designs to choose from! This looks so good, almonds are my weakness in sweet things! Beautiful watch! Must make the pavlova. Looks so yummy. Ive never tried pavlova! Im going to now, this sounds sooooooo good! Lemon is one of my favorite dessert flavors! Looks like a great way to enjoy a sweet treat! 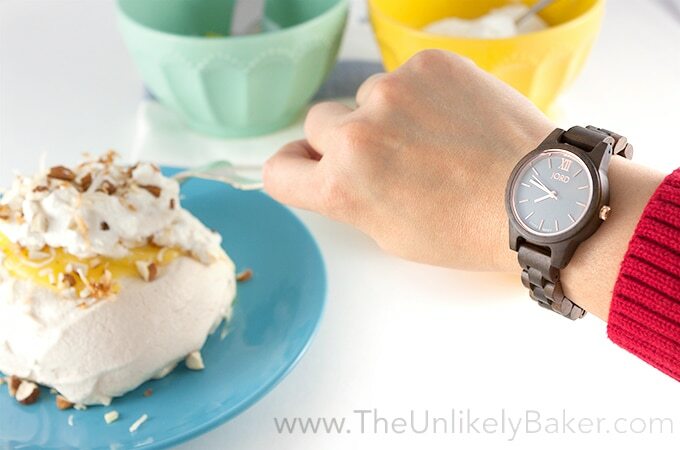 The watch looks gorgeous and the pavlova looks completely delicious!! 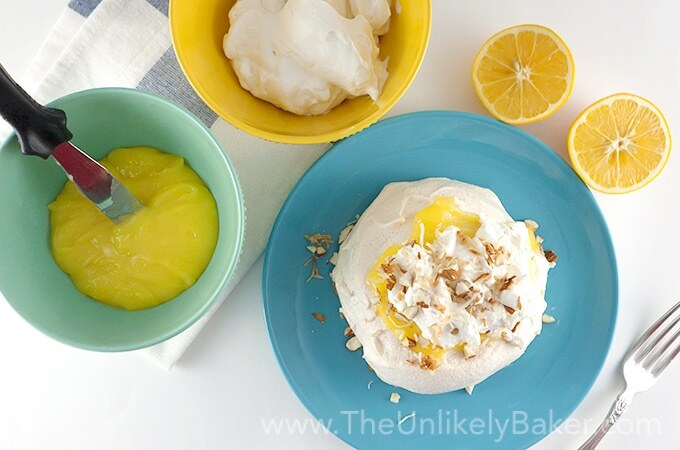 You probably know my love for lemon so this is calling my name 😉 I actually just watched a cooking show this past weekend where they made a pavlova and I was confident I was going to make one for the holidays and now after seeing this, I think it was meant to be 🙂 Love the addition of almonds and coconut. I may just go ahead and buy a tub of egg whites. Wouldn’t want to mess it up by accidentally getting egg yolk in there! Merry Christmas, my friend! Hope Santa is good to you!! Hi Dawn! Making meringue is quite hypnotic, I love watching the mixer just whip it up. Is that weird?? LOL! And yes, I would definitely say that is a sign. It’s been pretty brutal here lately are you guys getting ridiculous weather there too? Lemon always brightens up my gloomy winters! Merry Christmas to you and yours! This is drool-worthy! Not only the dessert, but the watch itself! Looks so elegant and amazing! Love it! That looks so yummy! Also that watch is stunning, I have always loved the look of Jord watches. 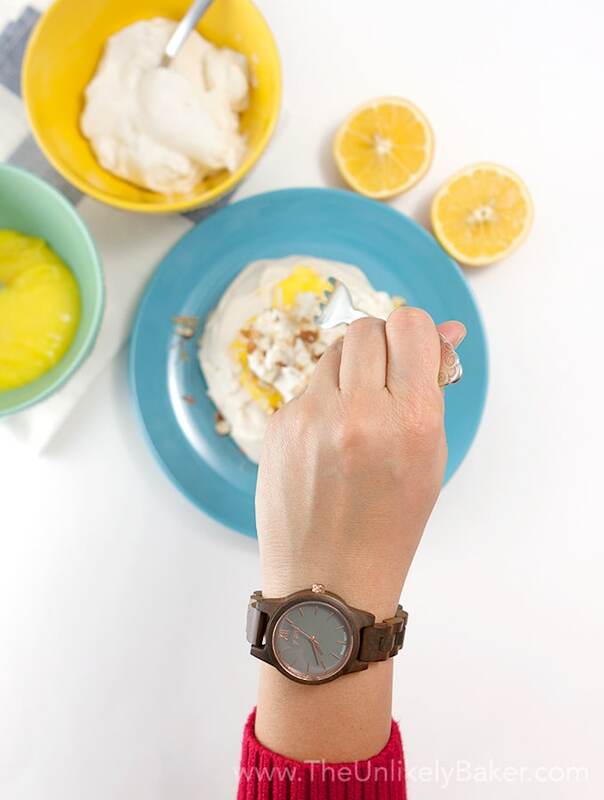 i love word watches, and the lemon meringue looks delicious! These look like a little piece of lemon heaven. The JORD watch is so cool! I once tasted a Pavlova in a restaurant and love it! It seems really difficult to make and master though with its contrasting texture on the inside and outside…Your photos are amazing though! Hi Vet! That’s the magic of pavlovas – looks impressive but it’s really simple to do 🙂 Hope you give it a go! I’ve seen these watches everywhere. They are so pretty. That’s a cool and unique watch. I know what I want for Christmas. Clicking to get the $25 discount now! Awesome! Hope you enjoy your JORD watch as much as I do! I just found a new love for meringue … that’s because of Pavlova. I like the addition of lemon curd and whipped cream. Hi Nicole! You know I’ve seen them around too and I’m so happy that now I have one. It’s really something else. So is the hubby getting one for Christmas? Get one for yourself too! 🙂 They are pretty cool. This looks so yummy! I made my first meringue this weekend, so may be brave enough to try this recipe out! Awesome! Meringue can be quite addicting to make and do once you get over that first hurdle 🙂 You’d enjoy putting this together for sure. Thanks Ali! Mmmm…. lemon and toasted walnuts sounds so good together. Pavlova is one of those desserts that looks difficult and impressive but it’s effortless to make…also love your pictures- I’m drooling! I totally agree, even the name is impressive lol. Thanks Bianca! I love pavlovas. They are not as hard to make ax they look and always a crowd pleasure. 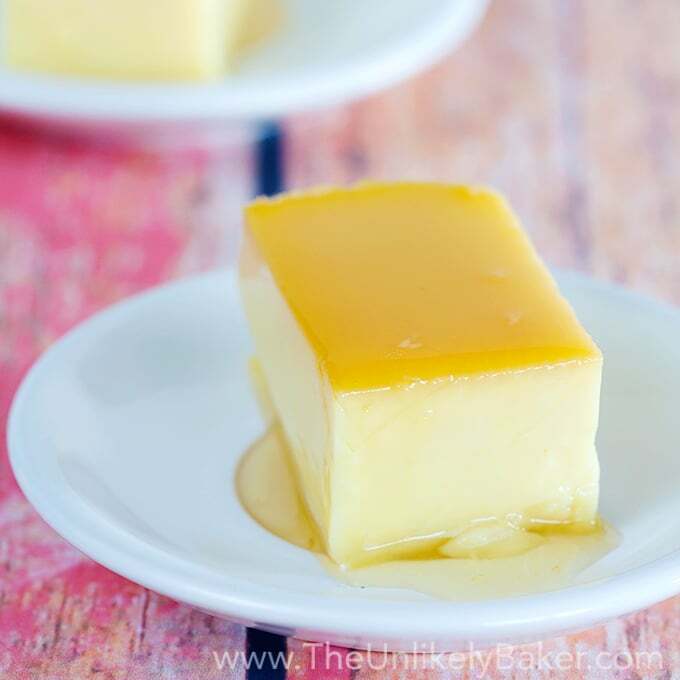 Lemon curd and coconut are a a great combo. Right?? They are stunning to look at but really simple to put together – those are the best recipes IMO haha. Thanks Gillian! Hope you get to try this combo one day soon! LOL yes that’s a pretty tough choice! 🙂 Hope you like this Mallory. I’d love to hear how it goes. 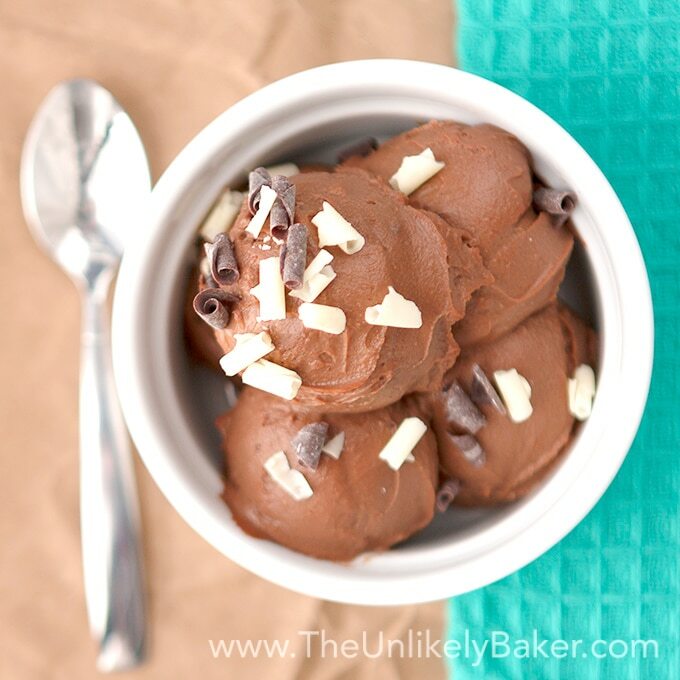 You had me at coconut! Anything topped with shredded coconut is bound to be delicious in my opinion! OMG I totally agree! I just find myself sprinkling toasted coconut on the weirdest things haha. I never tried Pavlova but it sounds interesting especially it has almonds and coconut which I love ! I definetly need to try it. I’ve never attempted a dessert like this one. It looks so light and bright and utterly delicious. Hi Christine! It’s incredibly simple to make but does not look it – those are the best aren’t they? LOL. BTW – totally jealous of your photo with Gordon Ramsay! I should totally try to make this, for the holidays! Lol nothing wrong with that 🙂 Or you can make individual portions! This looks so good and the watch is Beautiful! Thanks for this recipe. I’ve been looking for a fruity, lighter alternative for Christmas dessert. Looks like I’ve found it! Looks like such a yummy recipe! This dessert sounds perfect! Love your watch, too! I have never had Pavlova, but it looks divine! I love anything lemon flavored. Such a great gift idea and the pavlova looks super yummy too!